The Alliance has been fighting the Syndics for a century, and losing badly. Now its fleet is crippled and stranded in enemy territory. Their only hope is a man who has emerged from a century-long hibernation to find he has been heroically idealized beyond belief. 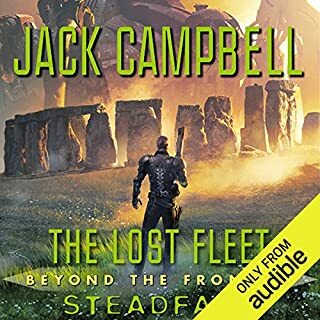 BONUS AUDIO: Author Jack Campbell explains how the legend of King Arthur, the Greek historian Xenophon, and other writings influenced the Lost Fleet series. 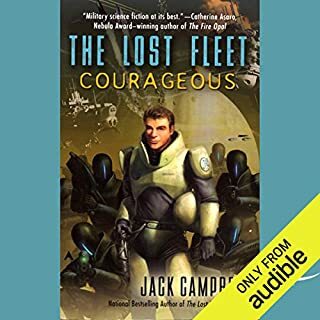 ©2006 by John G. Hemry writing as Jack Campbell (P)2008 Audible, Inc.
Love the ideas, long lost hero brought out of time, trapped behind enemy lines fighting to get home. However, every character feels like they were put there just to annoy me with bad dialog. Literally impossible for me to get past it. This entire story takes place in space, no planet of the week, but actual space travel. It takes a good writer to keep a story in space and not have to resort to landing on weird planets to make the story interesting. The hero worship theme gets real tiring after a while and it gets a little preachy, but I enjoyed the story and it kept my attention. I am looking forward to getting the next book in the series. The narrator was pretty good. I did have problems sometimes in knowing if the main character was thinking something in his head or saying it out loud. The main character has conversations in his head while he is talking to others and it is not always clear which he is doing. Anyone who enjoys being lectured endlessly about military regulations while fantasizing that they are an average minded adult in a universe full of toddlers. 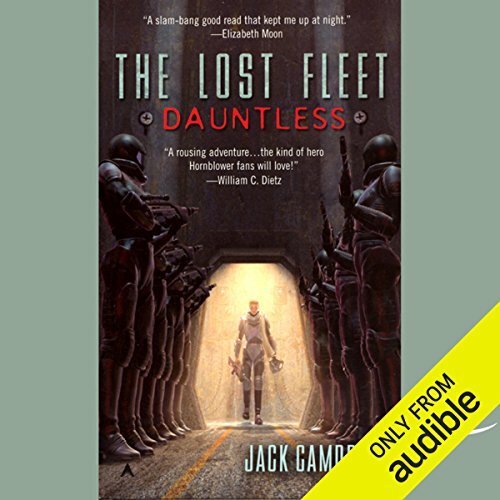 Has The Lost Fleet: Dauntless turned you off from other books in this genre? No. I am a fan of this genre, but this author is the Terry Goodkind of this genre. The universe is completely derivative and the characters are so two dimensional and undeveloped that it is hard for the reader to care what happens to them. 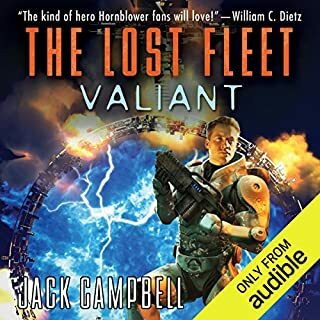 What does Christian Rummel and Jack Campbell bring to the story that you wouldn’t experience if you just read the book? 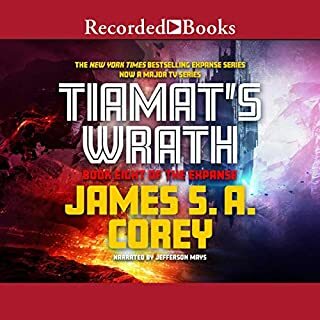 Christian Rummel's narration made it possible for me to finish the book. If I had tried to read this as a paperback, I would have donated it about 1/3 of the way through. 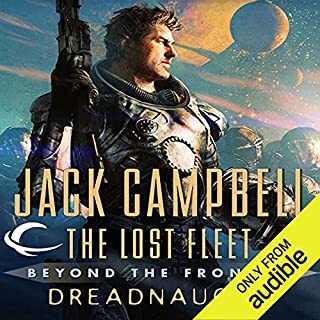 If you could play editor, what scene or scenes would you have cut from The Lost Fleet: Dauntless? The repetitive internal moralizing of the main character could have been cut down by 80% and been more effective. This would have freed up enormous amounts of space for the development of other characters. 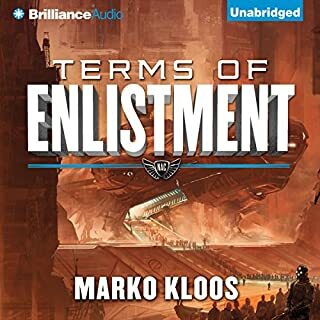 This audiobook ranks up there with the Prince Rogers, Miles Vorkosigan, and Honor Harrington series. 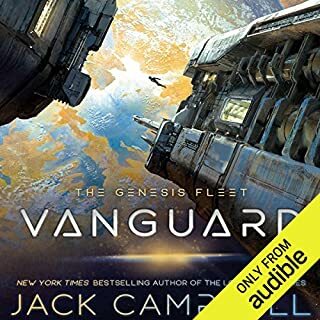 There seemed to be more space battles in this story than the others; so if that is what you like in a space novel, then this book is for you. However, the best part is a strong character whom you can cheer on. Captain John Geary is a man out of time having recently been rescued from stasis after a long time lost in space. He is a battle hero from his days and is worshiped by many of those in the fleet that picked him up. However, timing is bad for Geary as the fleet has headed into an ambush deep in enemy territory. This is the line of events we are thrust into at the very beginning of the book and may be a little confusing at first. 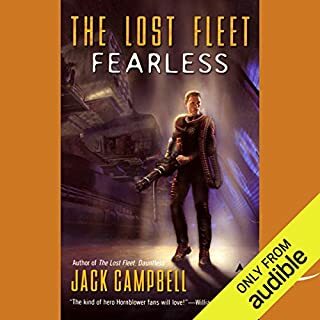 This story is about how Captain Geary must take hold of the fleet and save it from destruction with the goal to get everyone back home to safety. Enemies and difficulties may not only lie out in space but in the fleet itself. 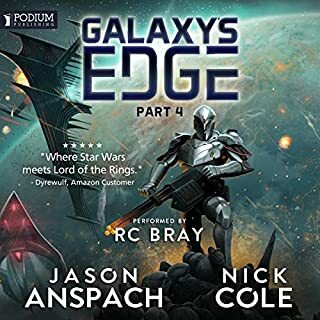 A long time of war has changed the hearts and minds of those that serve in the Alliance fleet and Geary must come to terms and live up to everyones expectations or find control of the fleet to slip out of his hands. The reader did an excellent job. I had no problem distinguishing characters. This is one of those books that made me want to download the follow up right away. 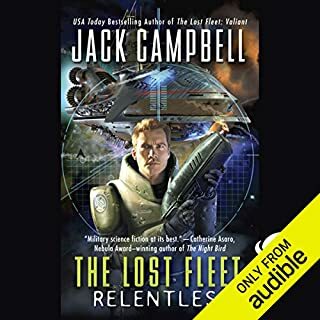 What disappointed you about The Lost Fleet: Dauntless? It's hard to believe that a war fought by so many people hell bent on self destruction could possibly last 100 years. Perhaps in the previous 99 years, a very large battle is fought every 10 years that literally destroys every space going warship in each fleet. Then, the next 10 years are spent rebuilding said fleets. Rinse, repeat. This must be the case given that modern tactics require throwing all assets into a battle with little to no thought given to tactics. Any future fleet officer with an IQ greater than 60 is either forcibly removed from command or assassinated. Such a waste that the writer attempted to make his main character look like Caesar by making everyone else as head-smackingly dumb as Gomer Pyle. 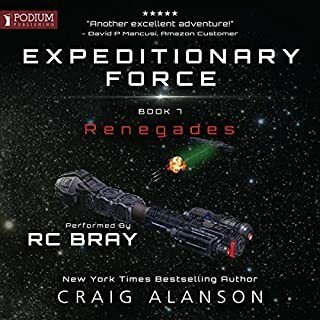 The space battles are quite thrilling and seem realistic enough despite the unbelievable carelessness off the enemy or for that matter all of the captain's subordinates. 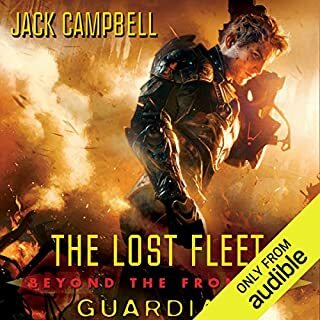 Would you ever listen to anything by Jack Campbell again? I have. I'm a space fight junkie and the space battles in these books were good enough to keep me running back for more. Up to a point anyway. Careful though. The last book in the series was the weakest. What about Christian Rummel and Jack Campbell ’s performance did you like? The narration was great. Not surprisingly, the main character is voiced powerfully and believably. The rest are passable which is quite impressive given the material. Every scene where the captain is talking to anyone but himself. If you've read this book, watch the movie Idiocracy. I enjoyed the first two of these books but I'm declining to read the third. They bid fair for becoming as endless Robert Jordan's "The Eye of the World" series. I liked the first couple of those, too, till I realized that there was never, ever going to be a resolution, as when the goal was accomplished, the series would end. The Lost Fleet plots were entertaining. If you don't mind the endless repetitive permutations necessary to this sort of series and the suspicion that nothing's actually ever going to happen because the goal of getting home will be the end of the series, go for it. 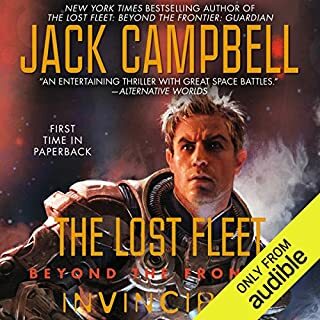 Be nice if Campbell could take a tip from Bujold and Forester, and give the captain a mission, let him perform it and send him out on another one, as he battles to form the fleet into a real honest-to-god fighting Navy. Got to say that Campbell's onto a good thing, here, professionally. But eventually he'll figure out why Arthur Conan Doyle tried to kill off Sherlock. 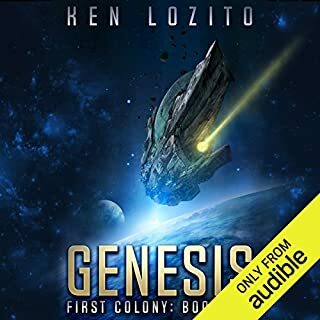 Was searching around Audibles database looking for a good Sci Fi series to read. Saw the Lost Fleet and downloaded the first one, "Dauntless". It is great, find it interesting concept for a long thought dead hero to come back and save the fleet. The light year lag in time makes an interesting tactical problem in space warfare. It is nice to see so many women in high ranking roles. Downloading the next in the series. 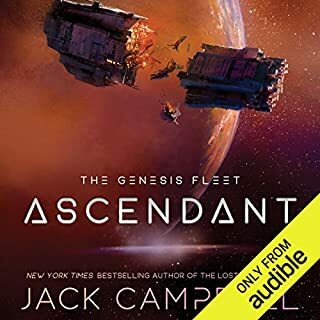 It is great that Audible has the entire series so I can listen in the correct order. 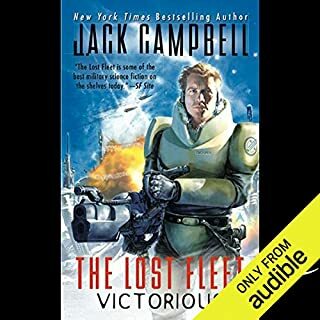 This is my first Jack Campbell book I will also look for books in his real name John G. Henry. There's a lot of inner talk by the main character, and the interactions with other characters are interesting - reflecting the usual human interactions and dilemmas of personalities, egos, morality, discipline, power plays, etc. The book's strong point is the tactics used in outer space for battles. In Star Trek, we'd see what Capt Kirk would come up with to fight with a single ship. In Lost Fleet, we see what can be done with multiple ships put into formations that change up as needed. Pretty fascinating writing there. However, the writing could use more sensory descriptions. The characters are faceless to me, just voices, as there is little to nothing in the way of description of their appearance. The environment is sterile without more descriptions of sounds and scents. There are some visuals, but more would be better. 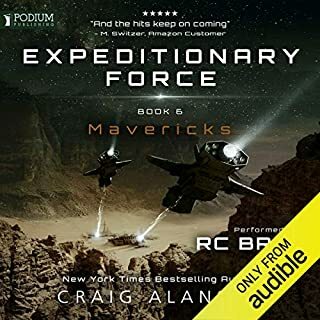 Narration is excellent, most characters have typical American voices, the diplomat has a British type of voice, there is an Irish voice used, and perhaps a slightly Russian or Slavic type? of voice used. The narrator could probably flex a bit and come up with more to distinguish characters and where the author didn't do enough to describe characters, the narrator filled in some of the gap. Production messed up in that the "scene" or "setting" shifts to another location and there is no pause whatsoever in the narration. So, it is up to the listener to mentally back up and figure out that suddenly the story has shifted to another time and place. Even a one second pause would have fixed that problem. 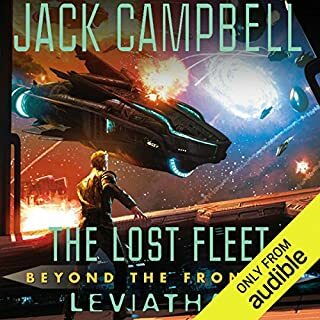 I bought the first and second book in a sale, so on to the second book, but might not have purchased the second book due to the lack of descriptions and less-than-3-D secondary characters. With so much inner talk in the book, the other characters really need to be stronger and better fleshed out to make the experience more colorful. I'm don't think I'll continue past the first book in the series. There's not too much depth to the characters and the plot seems like it's going to be a long, drawn out journey home. I didn't care for this book at all. In fact, I got so disillusioned with it that I almost quit listening several times, but kept going so I would be sure I had given it a fair try. The only good thing was the obvious knowledge that the author has about naval inner-workings. There were no descriptions about the look-and-feel of anything or anyone. While some authors can overdo this aspect, this author gave us none of it. It was clearly written by someone who is a very straightforward thinker who thinks explaining how anything looks, smells, feels, etc. is a waste of time. Same for the characters, at the end of the book you know about as much about them as you did by the end of the 2nd chapter. The author repeated for many chapters that the hero is reluctant, to the point where I physically yelled out "I get it already, I get it!" The author showed us all of the thoughts in the head of the characters, then made us sit through reading them again as they spoke their thoughts to the other characters. The characters are mostly simplistic and one-dimensional. There is almost no mystery, at least none that lasts more than about 5 minutes. So, if you like being spoon-fed a dry story from simplistic characters without getting emotionally invested and without seeing/touching/hearing/tasting/smelling anything, this is the book for you.